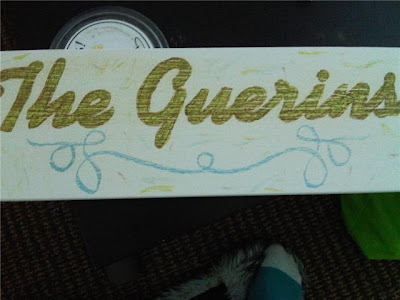 A few weeks ago I posted about making your own family antique sign along with the tutorial on how to do it that I had found on Addicted 2 Decorating blog. 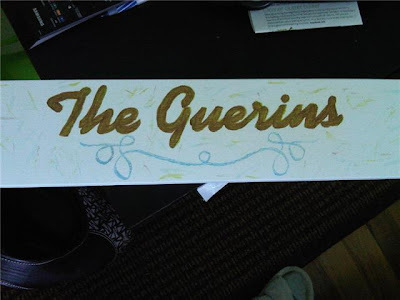 Well... this weekend I attempted to make a 'The Guerins' sign. After 2 attempts I'm calling this idea a complete FAILURE. 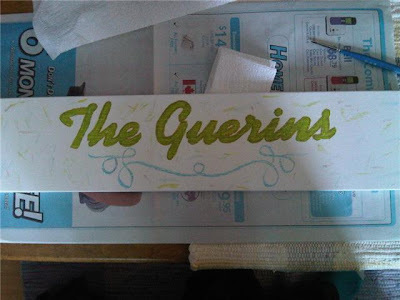 I painted the letters green and outlined them in brown with a blue swirly at the bottom. This is the result before sanding it. I wasn't too pleased with it at this point but was like HEY maybe the sandpaper will work wonders and make it look fantastic! I was even more disappointed when I sanded it down and it turned into this. Its hard to see the difference... its more grainy now but the sanding really didn't do what I thought it would do. SO after thinking I was just going to throw it out and that I couldn't make it any worse I decided to keep going. I repainted the green and then painted brown over top of the green in hopes that when I sanded it down it would bring the green out underneath the brown. I was VERY wrong in thinking I couldn't make it any worse.... this is the result of painting brown over green... puke browny green colour!! For now this project is going in the garbage... I do plan on attempting this project again from scratch. Next time my plan is to paint the wood all white, then paint it brown. THEN put the lettering overtop. I think that when you sand down the brown you'll see the white underneath which will bring the antique affect that I was going for. PLUS I won't outline the lettering... I think thats what ruined my first attempt! 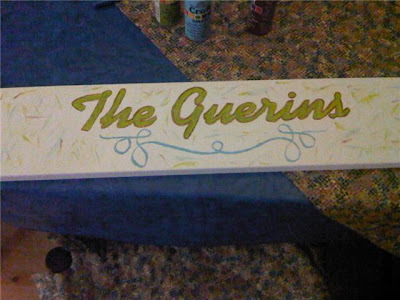 If I had just painted the letters green it would have been a LOT better! ANYWAY it was a trial and error weekend... I now know what does NOT work!! !